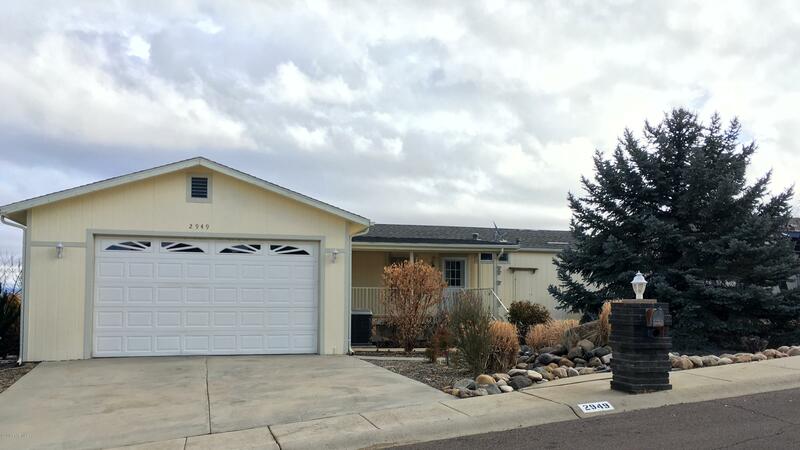 Move-in ready home with fresh interior paint, new kitchen counter tops, new scratch resistant vinyl flooring throughout, new toilet & tub/shower surround in guest bath. Open kitchen concept with vaulted ceilings & sky lights in the great room. Large windows offering views of the Granite Dells. Interior features include split floor plan with large bedrooms, laundry room, formal dining area & very large great room. Exterior features offer mature landscaping, storage room, vinyl fencing, front & rear covered patios. Rear patio/deck is screened in for dining enjoyment. This place is within walking distance to trails around Willow Lake & Watson Lake. Just a 10 minute drive to the Down Town area, 5 minutes to the nearest grocery store & 11 minutes to Yavapai Regional Medical Center!